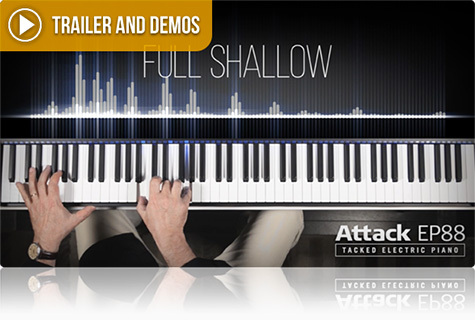 Attack EP88 is the world's first tacked electric piano library and possibly the most comprehensive electric piano library of any kind. 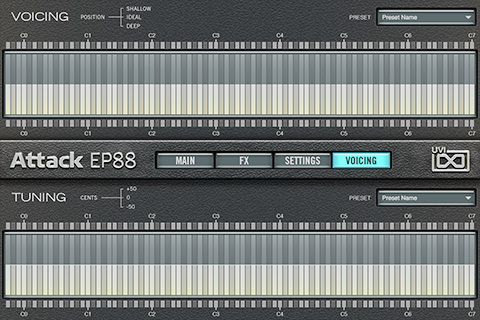 Built on a foundation of over 47,000 samples, Attack EP88 is an incredibly rich sounding and deeply customizable instrument, providing numerous discrete signal paths including DI, tube, contact mic, mono mic and stereo pair, unique envelopes and effects for both the electric and acoustic signals, and discrete voicing and tuning controls for all 88 keys. 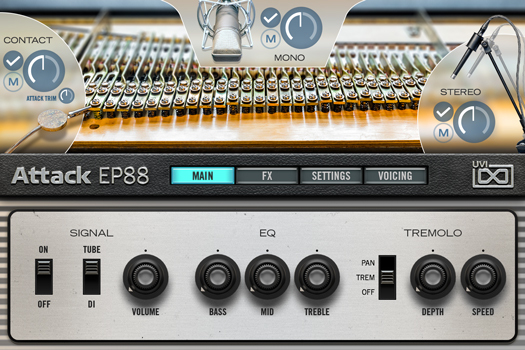 The only library of its kind, Attack EP88 delivers an entirely new take on the much-loved electric piano sound, in the most user-friendly and comprehensive way we could imagine. 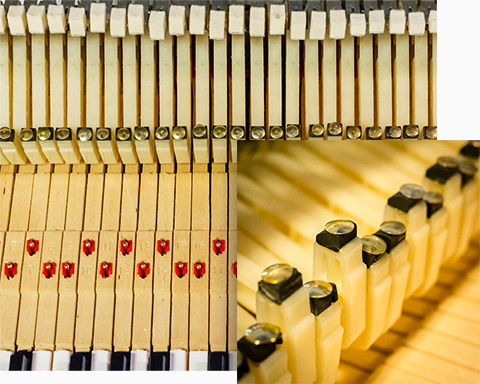 A 'tack' piano is a form of prepared piano most commonly seen on acoustic uprights where, as in this example, each of the hammers has had a brass tack or metal device installed on or between the mallets and the resonators. The sound is most definitely still piano but the initial attack phase is accentuated, it's more present, with a resonant metallic brilliance. As it turns out this preparation is quite exceptional on electric piano. The tonal character is almost bell-like in quality, giving a completely new perspective and life to the classic electric piano sound. Attack EP88 begins with a perfectly restored 88-key Rhodes Mark I prepared with a brass tack on the striking surface of each hammer. The goal of the project was to essentially deliver an entire virtual studio built around this instrument, allowing users to customize and explore it when and how they want. Doing this properly requires a number of sound sources and quite extensive recordings of each. Throughout, the utmost attention to quality and detail was made for everything from equipment selection to final editing, from UI and preset design to assembly. 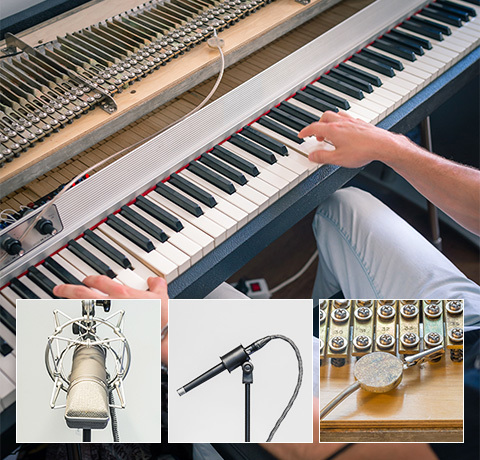 For the acoustic signals we employed a stereo pair of Bruel and Kjaer mics, a Neumann U67 in the mono position and per-key recordings with a contact mic attached directly to the tine. For each note 8 velocities and up to 5 round-robins were recorded per-source, along with 5 round-robins for both the sustain and release samples. This was done 3 times for the electric sources, once for each of the 3 included voicings (where the tack position is shifted on the hammer, resulting in changes of color from deep to thin). Additional recordings were made to capture the pedal-up and pedal-down sounds, this was done for the mono, stereo, contact and DI signals with 7 round-robins for each. The result of this process was a working base of over 47,000 samples, a truly massive library that beautifully captured even the most subtle nuances of the piano. The next task was to distill this enormous sample complexity into a focused and easy-to-use instrument. Attack EP88's audio sources are routed internally via three busses, one for the contact mic, one for mono and stereo mics, and one for the DI and tube channels. Each bus is equipped with a number of useful mixing tools including envelopes and effects, making it easy to dial in particular sounds or explore new ones. 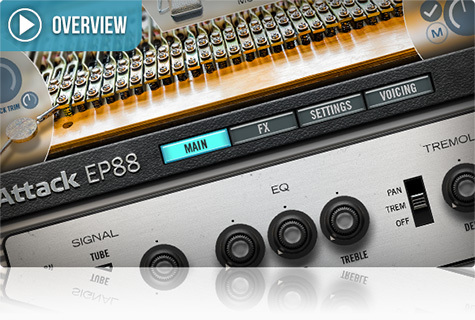 The user interface was carefully designed to make editing these signals as simple as possible, with acoustic sources at the top of the UI and electric at the bottom. 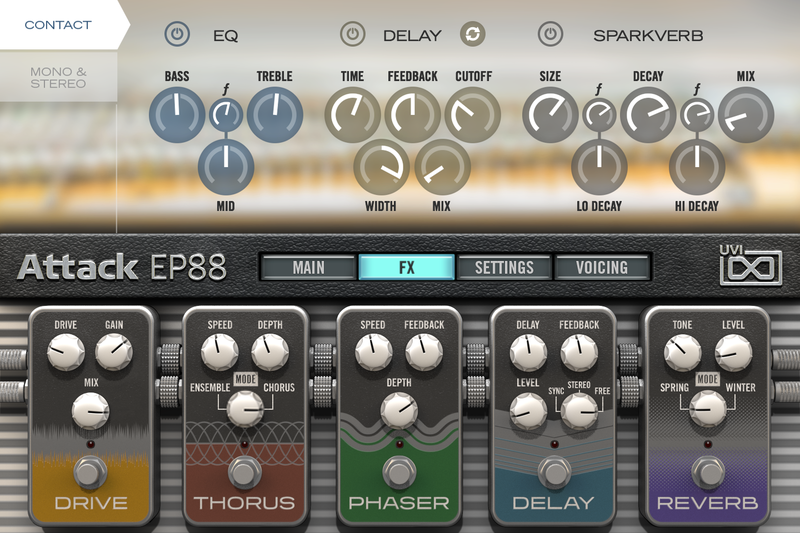 The acoustic busses are equipped with a 3-band EQ, Dual Delay and Sparkverb, and the electric bus with distortion, the 8-voice Thorus, phaser, Dual Delay and Sparkverb. Full control of these busses is made across 3 pages, Main, FX and Settings. A fourth and final page provides per-note control of voicing (each of which represents an entirely unique sample set per-source) and per-note control of tuning. Attack EP88 comes with 70 expertly designed presets which quickly display its fantastic detail and extraordinary sonic breadth. These can be used either as ready-to-play configurations or launchpads for near-endless exploration. Attack EP88 is an easy-to-use yet brilliantly deep instrument, one most people aren't likely to quickly exhaust. Providing everything from basic DI setups to rich and elaborate multi-channel configurations with custom envelopes and effects, Attack EP88 provides an extreme versatility, musical quality and immediacy that make it both a joy and inspiration to use. "The raw sound of Attack EP88 is nothing short of stunning – and genuinely different to every other software EP we've heard. Beyond that, the three busses and their dedicated effects offer plenty of sound-shaping potential, and the whole thing plays beautifully." "UVI have gone to great lengths to capture the sound of their uniquely modified piano, and the result is a characterful and distinctive twist on the classic Rhodes sound." 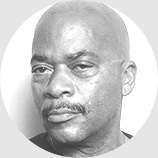 "Attack EP88 is a sample library that treats its source with reverence. The effect pedal simulations are top notch, the flexibility and control given to the user is second to none, and the price is just right. 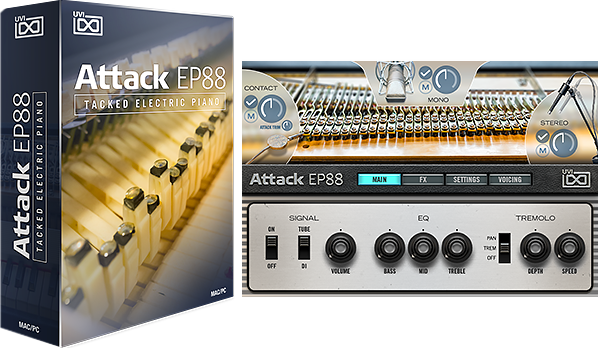 If you’re looking to take your Electric Piano sounds seriously, look no further than Attack EP88." "The quality of the samples and the flexibility of the package are simply impressive. 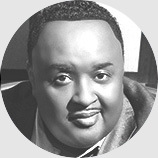 To me, it’s like having some of the best features of a modeled instrument with the obvious benefits of a sampled one. Even if you already have several Rhodes-inspired plugins, I’d recommend checking out the UVI Attack EP88." 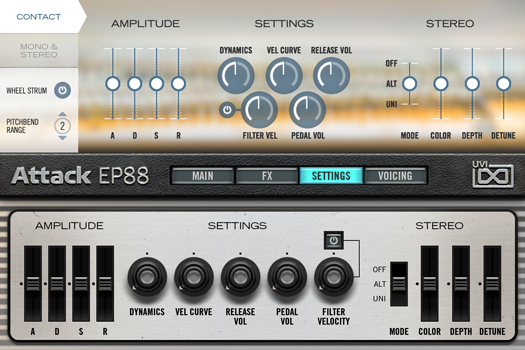 "Attack EP88 Electric Piano is a beast of a plugin – it’s got power to spare, and it’s just about the deepest sample set I’ve ever seen in my life. It’s got a near infinity of kinds of electric piano sounds available, and it plays very easily and sounds beautiful." "It's a great sounding electronic piano. A huge library, very deep sampled, and you can tweak the sound to something that even sounds like a synthesizer to get something completely different. But you can also keep it simple and you have a very good sampled Rhodes Mark I. I highly recommend it." "Attack EP88 is the most versatile EP in my library. It has a distinctive sound reminiscent of the Rhodes Dyno-My-Piano mods of the late 70’s-early 80’s. I’m very happy with it. "— Richard W.